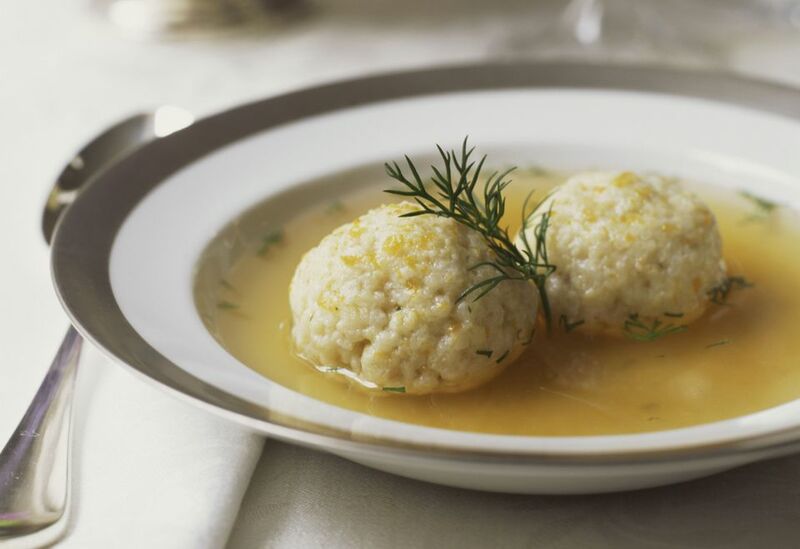 Crave matzo ball soup, but need a vegetarian recipe? Try this no-chicken matzo ball soup. Place chicken in a large soup pot. Add enough cold water to cover by 2 inches. Bring to a boil, then reduce the heat and simmer, for 20 to 30 minutes, skimming and discarding the froth that rises to the top. Add the carrots, zucchini, celery, onions, parsnips, salt, and a few grinds of freshly ground black pepper. Return to a boil, then reduce the heat and simmer, partially covered, for 1 1/2 to 2 hours. Adjust the seasoning to taste, adding a little chicken soup powder if desired to amplify the flavors. Allow the soup to cool slightly, then refrigerate until cold. Spoon the solidified schmaltz (chicken fat) off the soup. Strain the soup, return the vegetables to the pot if desired, and reheat before serving. In a large bowl, use an electric mixer or rotary hand beaters to beat the egg whites until stiff peaks form. In a separate bowl, whisk together the egg yolks, oil, and water. As an alternative to oil, you can also use the schmaltz (chicken fat) that rises to the top of the soup as it cools. In a third large bowl, mix the matzo meal with the salt and pepper. In alternate additions. gently fold the egg yolk mixture and matzoh meal mixture into egg whites to form a light, firm dough. Cover and chill for 30 minutes. Bring a large pot of water to a boil. Flavor with a little bit of chicken soup mix if desired. With wet hands, form the matzo ball mixture into balls about the size of a walnut. Carefully drop the balls into the boiling water. Cover the pot, reduce the heat to low, and simmer for 30 minutes, or until puffed and cooked through. Don't uncover the pot while cooking as this can cause the balls to fall. Matzo balls can be stored for two days a covered container in the refrigerator. To serve, reheat the chicken soup, strain the matzo balls from their cooking water, and transfer to the simmering soup. Keep warm over low heat until ready to serve.